Need some creative ideas for the Holidays? We have exciting new classes coming up that will make wonderful holiday gifts! There's still time to sign up, just give us a call at 704-821-7554. *Make the perfect Quilter's Utility Tote on Saturday Oct. 22 & 29. But fair warning-you may not want to give this one away. 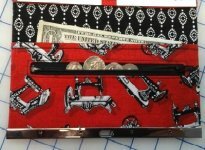 *The Diva Wallet is back by popular demand. We several requests to hold this class again before Christmas so people could learn how to make these for gifts. Join us Sunday, Oct. 30, but book soon-this class will fill up quickly. 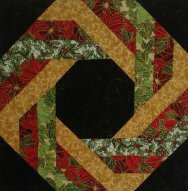 Go to http://www.quiltpatchfabrics.com/classes.htm for more information. We've just added Block 5 to our Neighborhood! Per your many requests, we have put Block 1 back on the website, and we will keep all of the blueprints available on the website until Dec. 24. Here are our versions of Blocks 1-5. Click here to download Block 5. Be the first to bring in a completed Neighborhood quilt (quilted and bound) and win a prize from Quilt Patch! Next Saturday, Oct. 15, is our Saturday Night Sew! Join us from 3:30-8:30 for some quality quilting time. Everyone is welcome! Cost is $2 and we order out for dinner. Just call us and reserve your spot (704-821-7554). Friday and Saturday, Oct. 14 & 15, is Barefoot Sale Weekend! Members of the Barefoot Club will receive a 20% discount on their entire purchase (excluding classes and quilting services). Not a member? You can join anytime with a one-time $15 fee and enjoy all of the benefits of being a Barefooter. You can even join on Barefoot weekend and the discount will pay for itself!